Tis' the season before the season when the holidays start to slowly invade our thoughts. For those with pets and holiday travel plans, things can get complicated. Should you take the pets along in your travels, or make arrangements for a pet sitter to take care of them while you're away? 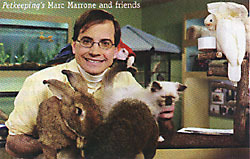 What does someone like Marc Morrone, the friendly face surrounded by a literal Noah's Ark of animals every Saturday morning on Fox 5's Petkeeping With Marc Morrone, do? "I haven't been on a vacation since my honeymoon fifteen years ago," Mr. Morrone quips during an interview with New York Tails, although we secretly suspect he's exaggerating-slightly. After all, while most of us may have to make pet care plans for a cat, a dog, a bird or a fish tank, Mr. Morrone's regular viewers know this Bronx-born native has Harry (a Scarlet Macaw), Darwin (an African Grey parrot), Splash the ferret, Harry the rabbit, Prunella the agouti, hedgehogs Bubble and Squeak, four frisky chinchillas dubbed "The Three Musketeers" and guinea pigs Mel and Seymour Goldstein to worry about. Oh, and did we mention Mr. Morrone has the exotic residents of his and partner Nick Guerra's pet store, Parrots of the World in Rockville Center, Long Island, to worry about, too? Let's assume you've decided to leave your pets at home during your holiday travels. Mr. Morrone strongly suggests using a professional pet sitter and suggests six questions to ask when choosing the right one. 1. "Do you have references from current clients?" Mr. Morrone says this is the first question pet owners should ask. "Give the pet sitter's current clients a call. If they're not happy, they'll do all the talking." 2. "Are you insured and bonded?" Evaluate your pet sitter, Mr. Morrone says, as if they were a repairman or handyman coming to your house and make sure they're carrying the right insurance for their profession. "You should also make sure that you have homeowner's insurance in case your pet bites them while you're away," he says. "If you don't have insurance, they could technically sue you for damages." 3. "What kind of transportation you have?" Mr. Morrone says this is an important question many city folks, who normally rely on public transportation and cabs, may neglect to ask. "If they have a beat-up old car, that's not good if they're depending on it to get your pet to the vet in a hurry in case of an emergency, or if they have a Volkswagon and you have a pair of Great Danes. Reliable transportation is a must." Special note: if you have a sick pet or one needing medication, Morrone suggests boarding it at the vet rather than keeping him/her at home and having the pet sitter pop in. "Your pet may be miserable at the vet compared to home, but at least you know something has less of a chance of going wrong." 4. "Do you have a reliable assistant?" Solitary pet sitters are fine until something goes wrong, such as they're getting sick or being unable to make it to your house for some reason. "The assistant's qualifications and transportation should be the same as the pet sitter's, and they should be covered under the same insurance as well," Mr. Morrone says. 5. "How do you like my pet?" Don't assume a pet sitter likes all pets equally, cautions Mr. Morrone. Have your potential pet-sitter meet your pet before they accept the job. Observe their interaction with your pet. "If they hesitate to interact with your pet while you're watching, what do you think is going to happen when you're away?" Morrone says. The answer to these questions, Morrone says, is critical. "Make sure you're dealing with a legitimate business with appropriate employees and adequate transportation. If one thing goes wrong, everything else goes kaplooey." Marc Morrone's syndicated show, Petkeeping With Marc Morrone, is produced by Martha Stewart Living and can be seen every weekend morning on Fox Channel 5 (Sundays at 7pm on UPN 59 in Connecticut.) Off the air, he shares his life with his wife, son and "Pet Squad" in Oceanside. Visit him at www.petkeeping.com or at his pet store website at www.parrotsoftheworld.com. For help locating a local pet sitter and more great advice on how to pick one, visit www.petsit.com. Click here for archived feature articles.